But is it the Razr? Motorola has been working on foldable phones, according to an interview with a company executive, and they don’t intend to release one later than other competitors. Whether that means later this year or next is unclear, but all the rumors around the company’s foldable plans now seem a bit more plausible. "We started to work on foldables a long time ago," Motorola VP of Global Product Dan Dery told Engadget in an interview. "And we have been doing a lot of iteration." A Wall Street Journal report early this year alleged that Motorola was working on a foldable phone that would reuse the famous Razr name and retail for $1,500 (about £1,170, AU$2,010). The report gave a slew of other very particular details, like Verizon and US exclusivity, though it claimed the phone would be ready by at least February, which hasn’t happened. Dery didn’t outright confirm or deny details from that report, or in any way mention the Razr name. 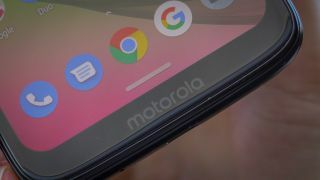 Instead, he gave somewhat vague comments that, nevertheless, still point toward deliberate design choices coalescing into a Motorola foldable phone we may eventually get. Dery seemed to qualify a lot of his statements in the hypothetical - if Motorola was working on a foldable, then the company wouldn’t intend to “put the display outside,” he told Engadget, citing all the scratches an outward-facing, plastic screen would suffer. Ergo, the company is focusing first on a clamshell-fold device, with an inward-facing primary screen akin to the Samsung Galaxy Fold, though we’ve no idea how similar Motorola’s new foldable phone will end up being. But the phonemaker is also looking at a dual-hinge device that folds twice for three separate ‘screen’ surfaces, though this is apparently too technically complex for Motorola’s first foldable. When, exactly, will that arrive? Motorola has "no intention of coming later than everybody else in the market," Dery told Engadget. With the Galaxy Fold launching in April and the Huawei Mate X arriving sometime mid-2019, the market will start filling up in the coming months.